Today I found out about Violet Jessop, “Miss Unsinkable,” the woman who survived the sinking of the sister ships the Titanic and the Britannic, and was also aboard the third of the trio of Olympic class vessels, the Olympic, when it had a major accident. Violet Jessop enjoyed incredible “luck” from a young age. Born in 1887 in Argentina to Irish immigrants, she contracted tuberculosis as a young child and was given just a few months to live. Somehow, she managed to fight the disease and went on to live a long, healthy life. When her father passed away, her mother moved the family to Britain, where she took a job as a stewardess on a ship. While her mother was working, Violet attended a convent school. Unfortunately, her mother became ill, and to provide for her siblings Violet decided to follow in her mother’s footsteps and become a ship stewardess herself. Violet started out on the line’s Magestic, switching to the Olympic in 1910. Despite the long hours and minimal pay (£2.10 every month or about £200 today), she enjoyed working aboard the massive ship. She had initially had some concerns about the rough weather conditions while traveling across the Atlantic, but she reportedly liked that the Americans treated her more like a person while she served them. It was just one year later when the trouble started. 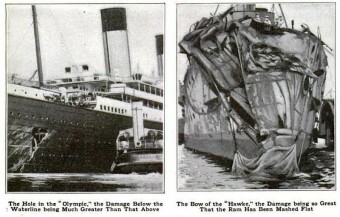 In 1911, the Olympic collided with the HMS Hawke (a ship designed to sink ships by ramming them). Both ships sustained considerable damage, including the Olympic having its hull breached below the water line, but miraculously didn’t sink. They were able to make it back to port, and Violet disembarked without being harmed. I was ordered up on deck. Calmly, passengers strolled about. I stood at the bulkhead with the other stewardesses, watching the women cling to their husbands before being put into the boats with their children. Sometime after, a ship’s officer ordered us into the boat first to show some women it was safe. As she was jumping into the lifeboat, she was handed a baby to care for. When they were rescued by the Carpathia, the baby’s mother (or at least Jessop thought it must be) found her and whisked the baby away (literally grabbing the baby out of Jessop’s arms and running off). Once again, Violet lived to sail another day. Although, she did later state the first thing she missed after the Titanic sank was her toothbrush that she’d left on board. You’d think she’d stop getting on ships at this point, or at least ships of the Olympic class, but not Violet. 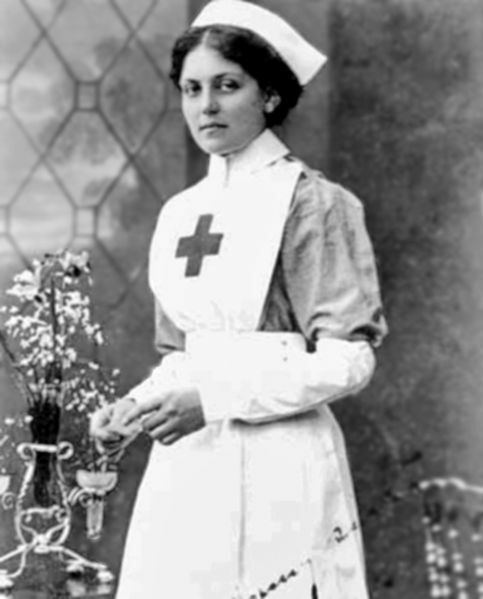 In the lead-up to World War I, she decided to serve as a nurse on board the Titanic’s other sister ship, Britannic, which was operating in the Aegean Sea. Given her track record, you can probably guess what happened next. The Britannic ran into a mine that had been planted by a German U-boat. The ship sustained substantial damage and quickly started sinking. I leapt into the water but was sucked under the ship’s keel which struck my head. I escaped, but years later when I went to my doctor because of a lot of headaches, he discovered I had once sustained a fracture of the skull! Violet didn’t accept that marriage proposal from the wealthy first-class passenger. She was married at one point, but only for about six months, and never had any children. She met her first love on board the Orinoco, but he said he had promised his mother he wouldn’t get married until he was promoted. As that was a long, long way off when he and Violet met, she cut off correspondence with him. No one knows the name of the baby that was placed in Violet’s care as the Titanic went down. There were 128 children on board the ship, about half of whom survived. Even the gender of the child isn’t known, and no one ever came forward claiming to be the child, though Jessop claimed she once had someone call her and tell her he was that baby, even though up to that point she had not told that story to anyone. There is only one child recorded as being in lifeboat 16 with Violet: 5 month old Assad Alexander Thomas. However, he was reportedly in the care of Edwina Celia Troutt, not Violet, after his uncle handed him to Edwina before the lifeboat launched. Newspapers claimed that the youngest child to survive the sinking was 11 month old Hudson Trevor Allison, a first class passenger. Obviously this was not the case, with several children younger than Hudson surviving. However, they were all second and third class passengers. the only reason she survived was because she is a women. Its obvious why all three sank and the source that connects all three. The 3 ships sank because of 1 common fact. There is no mystery here. Its just been covered up by money. The real story need to be addressed and revealed to every person who comes across one or all three stories. A few years ago, my daughter in law performed a One woman Theatre performance called White Star Lady, the story of Violet Jessop. It was written, produced and performed through Iron Mountain Theatre Company in Rossland British Columbia. Reference to violet can also be found at the Titanic Museum in Belfast, Ireland. God Bless her. What a hearty soul. Took guts for her to keep getting on board those ships. RIP Violet. I read the book about her story and it was sooo fascinating! She was quite a lady and worked very hard in those times; taking care of her mother and her siblings. She was their sole income. The trials she went thru as a sea stewardess were so informative. The lower class people and the ship help were in the bowels of the ship with very few amenities. They mostly all were lost in the Titanic sinking. You guys do realize this is an untrue story, right? Nice try. I have her book. So that shoots down your thoughts.